The Model 3000 (AF/AP) and 3000 (AF) which have been in production for twenty years are now revised to incorporate the upgrades of RTCA DO-183 for emergency locator transmitters. 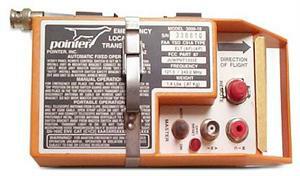 Now revised to incorporate the upgrades of RTCA DO-183 for emergency locator transmitters. The new models, designated 3000-10 (AF/AP) and 3000-11 (AF) are interchangeable with existing units in form, fit and function. The mounting bracket, directly interchangeable with the current design, has been modified for the new environmental requirements. A remote panel control switch with visual activation monitor, previously an optional accessory, is now required in all (AF) automatic fixed installations and many of the (AP) automatic portable installations, is now included in the complete kits. The standard whip antenna and coaxial cable previously supplied with the Model 3000 unit is interchangeable with the new models. Those components, if serviceable, may remain in use with the new transmitter. Existing remote switch wiring for current pointer units may be used, and installation of the switch requires minimal panel space. 3000-10 and 3000-11 transmitters incorporate an alkaline battery pack specifically designed to endure short term extreme thermal variations and mechanical shock requirements of RTCA DO-183. Emergency voice transmission is provided on the 3000-10 transmitter if desired. Size: 3 1/2"W x 7 5/8"H x 2-3/4"D.